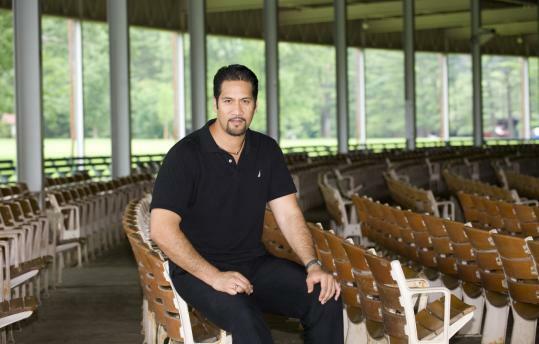 Ta'u Pupu'a, 33, an NFL player turned operatic tenor is a Tanglewood Music Center fellow. LENOX — Some 157 young dreamers will be sprinkled among the masses of blankets and folding chairs on the vast lawn outside Koussevitzky Music Shed when the Boston Symphony Orchestra begins its Tanglewood summer festival Friday night. It’s the 70th year of the Tanglewood Music Center, the BSO’s storied institute for emerging classical professionals, and as the members of this year’s class of fellows relax on the grass for the opening concert, they will have good reason to envision themselves up on the stage. For one thing, about a third of the orchestra has roots in the TMC. What’s more, the soloists in the opening-night performance of Mahler’s Symphony No. 2, “Resurrection,’’ soprano Layla Claire and mezzo-soprano Stephanie Blythe, were TMC fellows. Blythe spent the summer of 1993 at Tanglewood. Claire was sitting out on the lawn just last year. As a center for advanced musical study under the auspices of the BSO, the TMC is highly competitive to get into (nearly 1,600 applicants). That mindset takes time to settle in. As the fellows arrived last weekend, they could be seen walking around the 210 acres with maps of the grounds like summertime tourists. They came to Lenox from 21 countries. Among the oldest of them is a 33-year-old tenor whose earliest mentoring on a big stage was by a maestro well known to Bostonians. It wasn’t James Levine, although the promise of spending this summer performing under the baton of the BSO music director was what enticed Ta’u Pupu’a to Tanglewood (and ultimately was a source of disappointment when Levine had to bow out because of his continuing recovery from back surgery). No, the “conductor’’ in question was New England Patriots coach Bill Belichick, who back in 1995 was with the Cleveland Browns and selected Pupu’a, a defensive tackle out of Weber State University, in the fifth round of the NFL draft. Pupu’a sang his way to a full scholarship. His talent was raw, however, and remained so even as he auditioned for the TMC more than a year later in front of Levine. Pupu’a still brings his sports mindset to the rehearsal room. The dichotomy of building on your past while moving beyond it is also a focal point for the youngest of this season’s TMC fellows. Alexander Prior, a British conductor and composer who studies at Saint Petersburg Conservatory in Russia and has just completed an appointment as assistant to the guest conductors for the Seattle Symphony Orchestra, is 17. He’s been playing piano since age 3, composing since 8, and conducting since 13. Last year he hosted a British TV series called “The World’s Greatest Musical Prodigies,’’ in which he travels the world to audition wunderkind soloists to perform a concerto he composed. But don’t ask him about that. Prior’s relationship with music is likely what earns him the respect of orchestra players far older and more experienced when the teen stands before them, baton in hand. This summer he has much to prepare for: Today at 10 a.m. at Seiji Ozawa Hall, he will conduct an ensemble of brass and percussion fellows. Prior also will lead the TMC Orchestra in Strauss’s Suite from “Le Bourgeois Gentilhomme’’ on July 12 and Tchaikovsky’s “Romeo and Juliet’’ on July 25, both at Ozawa Hall. That, as it turns out, makes Prior a model TMC fellow. “What we hope for is that the kids are open-minded and imaginative,’’ said Highstein, who took over as director in 1997. She says that referring to the fellows, who average 25 years of age, as “kids’’ is in following “a tradition started by Lenny Bernstein.’’ He was in the first class of fellows, found a mentor in BSO conductor (and TMC founder) Serge Koussevitzky, and ended up teaching and mentoring young musicians here for the rest of his life. And while they’re at it, perhaps prepare you for the job of your dreams. Trumpeter Thomas Siders was a fellow the last two summers, working closely with the BSO brass section, “learning how they work, their styles of playing, what they’re like as people.’’ In January the 25-year-old won the position of BSO assistant principal trumpet. But inspiration is not a one-way street for the orchestral “farm team’’ known as the Tanglewood Music Center. The BSO derives a benefit from its summer teaching residency, one with significance well beyond job recruitment.